Facility and Equipment includes hazardous material storage, temperature control, rail, local delivery - Dallas Transfer and Terminal Warehouse Co.
Dallas Transfer owns and operates a 252,000sf modern concrete tilt-wall warehouse on 10 acres in Lone Star Industrial Park located on I-30, four miles west of downtown Dallas. This location is near the demographic center of the Dallas-Fort Worth Metroplex with excellent freeway access throughout the region. 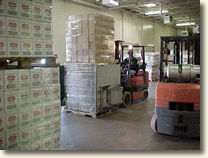 The warehouse has 20' clear height with 26 truck doors that include one ramp. 1,000sf of temperature control space (70F). The building has eight rail doors served by the DGNO Railroad. The siding is open to reciprocal switching to and from the BNSF, KCS and UP Railroads. The building is fully sprinklered with central station (ADT and Honeywell) burglar, emergency and fire alarms.